By default, Solr removes characters such as underscores or dashes from the words that are indexed. As a result, when a user enters a search phrase that contains these characters, no results are displayed. Example: "wi-fi" is indexed as "wi" and "fi". Step 1. Open the file <Solr installation directory>/schema.xml. Step 2. Look up the fieldType block starting with <fieldType name="textNGram". This block contains 2 definitions for 'solr.WordDelimiterFilterFactory' (in analyzer type="index" and "query"). Step 3. Comment-out or remove both definitions. Step 4. Restart Tomcat (it might also be needed to restart Apache as well). The applied schema.xml changes now need to be applied to the database objects. Step 5. 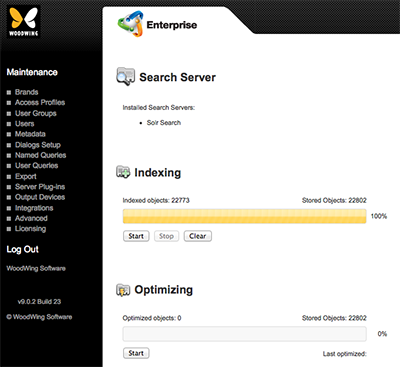 Access the Search Server Maintenance page in Enterprise Server. Step 6a. Click Integrations in the Maintenance menu or on the Home page. Step 6b. Click Search Server. Note: See also Solr Wiki: Analyzers, Tokenizers, and Token Filters.